This study aimed to quantify the active biological compounds in C. officinalis flowers. Based on the active principles and biological properties of marigolds flowers reported in the literature, we sought to obtain and characterize the molecular composition of extracts prepared using different solvents. The antioxidant capacities of extracts were assessed by using spectrophotometry to measure both absorbance of the colorimetric free radical scavenger 2,2-diphenyl-1-picrylhydrazyl (DPPH) as well as the total antioxidant potential, using the ferric reducing power (FRAP) assay. Spectrophotometric assays in the ultraviolet-visible (UV-VIS) region enabled identification and characterization of the full range of phenolic and flavonoids acids, and high-performance liquid chromatography (HPLC) was used to identify and quantify phenolic compounds (depending on the method of extraction). Methanol ensured more efficient extraction of flavonoids than the other solvents tested. 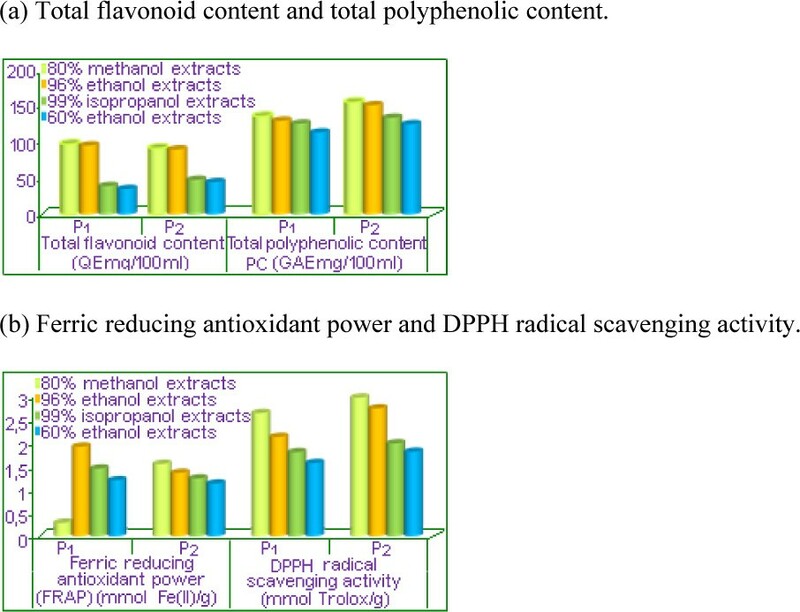 Antioxidant activity in methanolic extracts was correlated with the polyphenol content. The UV-VIS spectra of assimilator pigments (e.g. chlorophylls), polyphenols and flavonoids extracted from the C. officinalis flowers consisted in quantitative evaluation of compounds which absorb to wavelengths broader than 360 nm. Owing to their distinct composition and economic value, cultivation of marigolds (C. officinalis) continues to increase , and the European Union has sponsored several programs for the investigation and exploitation of this species [2–4]. The therapeutic properties of marigolds are attributed to the diverse range of biologically active substances they contain . Owing to their anti-inflammatory, healing, and antiseptic properties, C. officinalis extracts are applied externally to treat various skin ulcerations, eczema and conjunctivitis, and internally to soothe pain arising from stomach ulcers and inflammation. Marigold is renowned for its antispasmodic, aperient, cholagogic, diaphoretic and vulnerary properties . Phenolic compounds (flavonoids and phenolic acids) and saponins are both abundant in marigold . C. officinalis also contains carotenoids and triterpenic alcohols, both in their free and esterified forms [8, 9]. C. officinalis-derived carotenoid pigments  and polyunsaturated fatty acids, such as calendic acid , have been shown to have inflammatory properties in vivo and inhibitory properties in vitro . Marigolds are also characterized by the presence of some important polycarbohydrates , which are soluble in water, and play a role in tissue soldering and controlling cellular permeability [13–15]. Other substances identified in C. officinalis extracts are proteins and amino acids , saturated hydrocarbons , vitamin C  and mineral substances . Given their strong aromas , etheric oils could attract insects, thereby promoting pollination indirectly [21–23]. Some volatile substances  represent final products of anaerobic biodegradation of carbohydrates  accumulate to levels comparable to those synthesised in cells . Besides their role as antioxidants , polyphenols (especially flavonoids) have antimicrobial properties [28, 29]. Our previous studies used chromatography to demonstrate that marigold is a good source of natural antioxidants, in particular polyphenolic substances. Polyphenols are normally characterized by their specific chromatographic behaviours and distinctive UV-VIS spectra. The objective of this study was to use spectrophotometry to evaluate the contents of phenolic and flavonoid compounds, and the radical-scavenging activity in extracts of different marigold samples. The main phenolic compounds in C. officinalis tested in this study were systematically identified by comparing HPLC profiles of samples with those of authentic phenolic standards and published data (information in patents RO122836-B1) . We used HPLC to simultaneously separate, detect and quantify phenolic compounds, chlorophylls and carotenoids in a single run. The availability of a method to obtain a bioactive profile of different vegetation matrices should help to meet increasing demands for information on biological compounds and their properties, not only in marigold flowers but also in other natural food sources. The present research describes a Folin-Ciocalteu (FC) method for the analysis and the quantification in fast time. The fast method was validated in term of repeatability, reproducibility, linearity, accuracy, optimised analytical method were then conducted in order to quantify phenolic compounds. Spectrophotometric assays to determine the total flavonoid and polyphenol contents of plant extracts were adapted for use with a UV-VIS spectrophotometer (PG Instruments) and soft UV WIN 5.05 to measure the absorbances of reference solutions (QE and GA), and the absorbances of samples from plant extracts . Spectrophotometric assays for the calculation of concentrations of quercetin (QE) were based on absorbance measurements taken at 420 nm. Spectrophotometric determination of gallic acid (GA) content was calculated at 765 nm. The linearity of the method was verified through the method of least squares, which was applied in the concentration range 2-32 μg/mL for QE and 1-10 μg/mL for GA, with a correlation coefficient R2 > 0.99. To verify the results, replicate calibration curves were compared to the reference substances for three consecutive days. A slight difference was observed between the calibrations curves generated for QE, whereas those for GA were nearly identical. All the determination factors of equations of calibration straight lines (R2) were greater than 0.99. The precision of the method was calculated by comparing the determined quantity of the substance with the quantity of substance calculated based on statistical analysis using the program ORIGIN 7 (Standard/Professional versions). For all control samples, differences between experimental samples and standards were never statistically significant (P < 0.05). The accuracy (percentage deviation of the concentration determined relative to the calculated concentration) and the precision (standard deviation/coefficient of variation) of methods always fell within accepted ranges (± 15% of the mean). The sensitivity of the method was calculated using 2 μg/mL of QE and 1 μg/mL of GA. In both instances, when the accuracy and precision framed in admitted limits in such determinations added up to the quantification limit (± 20%). Phytochemicals and in particular phenolic acids and flavonoids compounds present in C. officinalis flowers may be partially responsible for these health benefits through their antioxidants activity. In the present study, the main goals consist in isolating total flavonoid and polyphenolic compounds by spectrophotometric assays in the ultraviolet-visible. To distinguish rapidly between various samples, flavonoids were extracted from flowers by immersing (without crushing the tissue) in solvents (HPLC method, we investigation for a patent RO122836-B1). In accordance with the international standards of the Organic Crop Improvement Association (OCIA), the International Federation of Organic Agriculture Movements (IFOAM) and the National Organic Program of the U.S. Department of Agriculture, the use of environmentally friendly extraction procedures, such as maceration, is needed to obtain such natural ingredients. We used an objective HPLC assay coupled to spectrophotometric methods for exhaustive characterization of polyphenolics, including compounds with antioxidant potential such as flavanols, phenolic acids and carotenoids, from an extract of C. officinalis flowers. The most abundant phenolics were quantified using HPLC by comparison with external standards of known phenolics. Concentrations of polyphenols in experimental samples varied according to the type of plant material and the solvent used for extraction. Values determined using the DPPH method (Additional File 1 and Figure 1) showed that antioxidant activity was significantly greater with the variety P2 than the variety P1. This might be explained by greater enzymatic activity in the former. Measurements were taken between the wavelengths 440 and 750 nm. All scans obtained using experimental samples were compared with those obtained using pure solvents. Measurements were taken 30 min after addition of DPPH in order to ensure enough time for the antioxidants to react with DPPH. As shown in Additional File 1 absorbance changes at this wavelength indicate whether DPPH radicals are in an oxidized or reduced state. Thus, this wavelength enables a straightforward analysis and interpretation of the measured decrease in absorbance. The hydrophilic antioxidant activity was evaluated using both the FRAP and DPPH methods. Antioxidant activity was greater in samples from the variety P2 samples than those from the variety P1, possibly owing to greater levels of biosynthesis in the former than in the latter. The use of FRAP methods resulted in similarly small values for all three types of extracts. The huge distribution of materials and biological liquids of the biologically active molecule did not facilitate the adoption of a general method-available for extraction-which could be applied in a general way, and adopted as standardized technic. The wide range of analytes and solvents used prevented us from using a standard extraction procedure throughout the study. Extraction of carotenoids using the unipolar organic solvents  ethylic ether or chloroform involved maceration of plant tissue followed by mechanical agitation and transfer of the extracts to a boiling water bath. A considerable amount of trituration was necessary to ensure complete extraction; because the unipolar solvent did not penetrate the cellular membrane to dissolve the carotenoids. Contents of compounds with antioxidant potential from C. officinalis extracts. As fresh material has high levels it must first be dried prior to extraction with miscible solvents, such as acetone, methanol, and ethanol [33, 34]. The plant material might then be sufficiently anhydrous to enable extraction using non-aqueous solvents. The objective of this experimental part was to the quantification of antioxidant activity by spectrophotometry (Additional File 1). We developed a simple and efficient method for extracting. It was to identify flavonoids in its extracts, to determine the quantity and make a projection on its antioxidant capacity by DPPH spectrophotometric method. The model of scavenging the stable DPPH radical is a widely used method to evaluate the free radical scavenging ability of various samples. Organic extracts contained carotenoids as well as some waste substances, such as chlorophyll [35, 36]. Analysis of the results from Additional File 2 reveals differences in the contents of assimilator pigments in the analysed samples. The higher quantities of chlorophyll b (Figure 2 and Figure 3) suggest the capacity of flower tissues to capture light radiation to enhance the capacities of the plants to convert light energy into potential chemical energy. Samples that produce larger quantities of carbohydrates are derived from tissues that provide substances needed for development . The absorption spectrum of 80% methanolic flower extracts of C. officinalis. Absorption spectra of C. officinalis flower in methanol 80%, ethanol 96%, isopropanol 99% and ethanol 60%. As previously reported , a quantasome (complex between photosynthetic pigments and protein-phosphorus membranes of grana)  comprises 230 chlorophyll (Chl) molecules (160 Chl a and 70 Chl b molecules) and approximately 50 carotenoid molecules. Chlorophyll a molecules act as reaction (trap) centres (P700 in photosystem (PS) I and P680 in PS II). Theoretically, the Chl a: Chl b ratio could vary between 1: 2-1: 3. From our data for the Petran variety (P1), the only sample for which the ratio between chlorophyll types a/b of chlorophyll was 1:2 was the methanol extract (sample 1). The ratio in the other three extracts was 1:3. For both the methanol and ethanol extracts of the Plamen (P2) variety, we found a Chl a : Chl b ratio of 1:4. The variations in the relative contents of chlorophylls a and b may be related to disturbances at the level of PS II . Wavelength scans of all extracts of C. officinalis are shown in Figure 3. Specific absorption patterns enabled us to identify particular molecule groups and domains. One of the most important functions of carotenoids is the photoprotection of the photosynthetic apparatus by quenching triplet chlorophyll, singlet oxygen and other reactive species. Carotenoids are structural components of light-harvesting chlorophyll a/b protein complexes of PSII (LHCII) and PS I. They are involved in both the stabilization of LHCII trimers and the assembly of LHCII monomers . To be useful as a measure of cellular antioxidant potential, absorbance at the selected wavelength should be mainly influenced by the DPPH radical and not by interferences caused by antioxidants, such as carotenoids and polyunsaturated fatty acids. Given that signals at wavelengths below 530 nm are strongly influenced by carotenoids, this could result in misinterpretation of the measured absorbance decrease when a wavelength is chosen that is influenced by both the DPPH radical and the absorptive properties of the extract, as occurs for extracts containing carotenoids. To a large extent, this kind of interference can be eliminated by measuring the absorbance of a reference sample containing the same extract as the sample containing DPPH. Our efforts to quantify the total content of carotenoids in extracts reveal the importance of the solvent selected for sample extraction. Methanol extracted carotenoid pigments more effectively than any of the other solvents tested. We used two spectrophotometric methods, which involve the capture of free radicals in solution by DPPH and estimation of the total antioxidant potential (FRAP), to provide complementary sources of evidence for the different antioxidant potentials of extracts from C. officinalis flowers. By correlating the composition of phenolic compounds with antioxidant action in flower tissues, we found that extracts from the C. officinalis variety Plamen (P2) had higher antioxidant potential than extracts from the Petran (P1) variety. 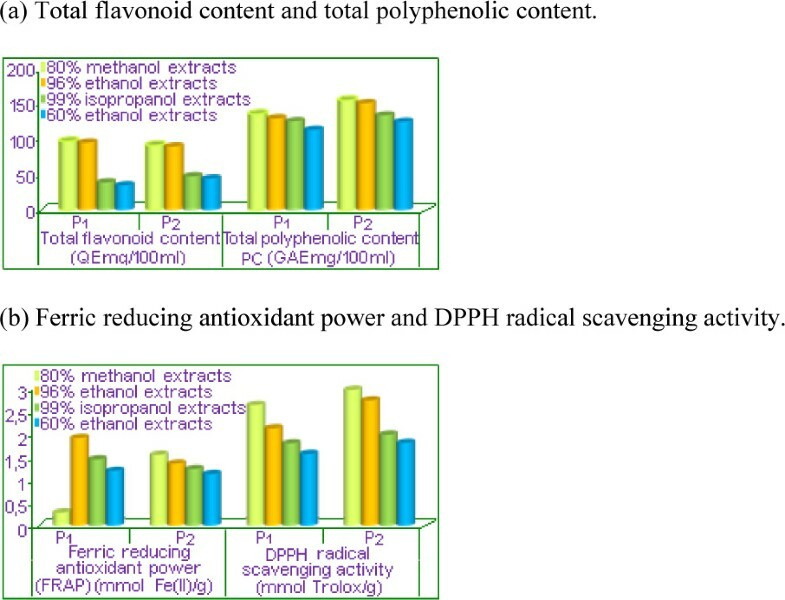 The relationship between antioxidant activity and flavonoid content was not linear, which suggests that the antioxidant activity depends on the total polyphenol content. Volatile organic bio compounds are directly amenable to analysis by gas chromatography, a technique of unsurpassed separation capacity. Flavonoids are considered favoured bio compounds as chemotaxonomic markers in plants because they show large structural diversity and are chemically stable. The methodology developed in this work, identification and quantification of major phenolic compounds by samples used more easily accessible FC methods for determination of polyphenols. Method based on the classical norms and on the standard operating procedures developed in the Biochemistry Department, gave for each validation criterion a value in agreement with the limitations of the previously cited norms. Antioxidant components in the extracts were identified by combined HPLC methods and spectrophotometric analysis. Through spectrophotometric analysis of the extracts in the UV-VIS range, we identified specific phenolic acids and flavonoids. Methanol enabled more efficient extraction of flavonoids than the other solvents tested. The highest antioxidant activity correlated to the polyphenol content was obtained for extracts prepared using methanol. Biochemical analysis determined the content of assimilator pigments, as well as flavonoids, which were expressed as equivalents of QE. After the spectrophotometric dosage of flavonoids expressed in QE was obtained, the values included the following: 96.17/34.8 QEmg/100 mL. According to the European Pharmacopeia, the minimal condition of quality was of 0.4% total flavonoids expressed in QE. The raw material quality of C. officinalis (Flores Calendulae) marigolds was conditioned by the major content in flavons and polyphenols, which accumulated during the flowering period. Plants were collected from a field site at the Teaching Base of USAMVB Timisoara. The two types of plant specimens, the variety Petran (P1) and Plamen (P2) were collected and tagged on the spot using standard techniques (the varieties were grown under the same conditions). The plant specimens that were preserved as herbarium specimens were identified using the standard reference for this purpose , compared with specimens from the Department of Plant Resources, and identified with the help of taxonomists from the Department of Plant Phytotechny at the USAMVB Timisoara. The four solvents used for extraction were methanol (80%), ethanol (96%), isopropanol (100%) and ethanol (60%). The general process of maceration on a small scale involved placing suitably crushed plant material, or a moderately coarse powder made from it, in a closed vessel and adding the selected solvent to allow the solvent sufficient time to penetrate the cell wall to solubilize the constituents within the cells and for the resulting solution to penetrate the cell wall outwards. As the system is static, except for the occasional shaking, the process of extraction works by molecular diffusion, which is very slow. A closed vessel is used to prevent evaporation of the solvent during the extraction period, and thus avoids batch-to-batch variation. At the end of the maceration process, when equilibrium has been reached, the solution is filtered by passage through a special press. The concentrations of active constituents in the strained and expressed liquids, sometimes called miscella, are identical, and can thus be combined. Given that the expressed liquid may be cloudy with colloidal and small particles, a certain amount of time is often necessary for coagulation and settling of particulate matter. The settled matter is filtered using a filter press or any other suitable apparatus. The maceration extraction method is the simplest non-selective method. C. officinalis flowers were kept in a cold environment in contact with the solvent at room temperature (17-22°C) for 14 h, stirring occasionally before the extract was separated. An additional round(s) of maceration increased the efficiency of the process. The extracted product was first mixed with 1/2-2/3 of the total quantity of solvent, after which the liquid was separated and the residue released. It comes in contact with the rest of the solvent, resulting in one ninth quantity of solution mining. The two liquids extract and filter together after another 24 hours. Owing to the relatively reduced thermal stability of natural aromatic compounds, the process was conducted in the presence of the antioxidant ascorbic acid (0.5% w/v) . Extraction rate (1: 10 g of flowers powder/mL solvent). Polyphenol-containing extracts of C. officinalis flowers were separated on a C18 (150 mm × 4.6 mm, 3 μm) column, with a mobile phase consisting of three different solvents, using an Agilent 1100 HPLC apparatus. The flow rate was 0.7 mL/min and the injection volume was 20 μL. For the first separation system (ternary solvent), which was used for the separation of flavanols and phenolic acids, the initial mobile phase consisted of 2% acetic acid in water/methanol. For separation of flavonols the second system (binary solvent: 0.25 mM phosphate buffer, pH = 2.5/acetonitrile), polyphenolic compounds were separated using a third system (binary solvent: 0.1% formic acid in water/methanol). The column temperature was adjusted at 20°C. Phenolic compounds were detected at 260 nm. The separated compounds were identified by comparing their retention time (Rt) and UV spectra with those of authentic standards. Compounds were quantified using a standard calibration curve. Total phenolic and flavonoid contents were quantified as the sum of the related identified phenolic compounds. The compounds were identified by comparing with standards of each identified compound using Rt, the absorbance spectrum profile, and also by running the samples after the addition of pure standards . The total polyphenol content was calculated using the FC reagent and Na2CO3 10%; ulterior the maximum absorption was evaluated by the obtained coloration, in relation to the calibration curve. The total content of phenolic compounds was evaluated using colorimetry based on the chemical reduction of the mixture of tungsten and molybdenum oxides to form a blue product that absorbs strongly at 760 nm. The formation of blue compounds derived from FC-reactive phenols was independent of the structures of the phenolic compounds, enabling quantification of the full complement of phenolics from plant extracts. Approximately 10 g of pulverized plant material was extracted with 100 mL solvent. The total concentration of phenolic compounds in the extract was calculated through comparison with a curve prepared in a similar way based on measurement made using known concentrations of GA ranging between 0-00 μg GA/100 mL. The total content of phenols in samples was expressed in equivalents of GA (mg) in a gram of dried plant material. Levels of polyphenols were expressed in mg/g equivalents of GA in relation to a final concentration 20 μg/mL. The combined level of all flavonoids was calculated by reaction with a 3% (w/v) solution of AlCl3 (anhydrous salt) prepared in ethanol. Concentrations were correlated with absorption values by using a calibration curve constructed using known concentrations of QE. The total content in flavonoids expressed in mg/g (QE equivalents) was related to a final concentration by 20 μg/mL. Approximately 10 g of pulverized plant material was extracted in 100 mL of an 80% aqueous solution of ethanol (or other solvents) at the room temperature for 1 h.
The extracts were filtered, and the filters were left to evaporate in a dry environment. The neutralization effect of the DPPH◦ free radical was calculated at three different concentrations of methanol and ethanol extracts: portions of 0.05 mL from extracts of 10, 5 and 2.5 mg/mL were mixed with 2.95 mL solution DPPH◦ in the cuvette used for spectrophotometry. After a 5-min reaction time, the absorption at 420 nm was compared with that of methanol. QE was used as a positive control. At a concentration of 2.5 mM, QE was able to fully neutralize (the level of DPPH◦ radical used). We used a simple spectrophotometric method to evaluate the antioxidant power of the plant extracts. This involved reduction of ferric tripyridyltriazine [Fe(III)-TPTZ] to coloured ferrous tripyridyltriazine [Fe(II)-TPTZ] at low pH. The coloured product absorbs strongly at 593 nm. All samples were extracted in acetone. The pigments were extracted from C. officinalis flower with 80% acetone. We used the specific absorption coefficients of chlorophylls a and b, and carotenoids (Car) to estimate their levels using spectrophotometry. All of the chlorophylls contained two main absorption bands of radiations: one on the blue side or near the UV portion of the electromagnetic spectrum, and the other on the red side or near the IR region of the electromagnetic spectrum. The lack of a significant absorption on the green side of the spectrum confers on chlorophylls their characteristic green or blue-greenish colors. The working methods were based on the Ro Pharmacopeia 1993 techniques in conformity with international standards (Ph. Eur. Reference Standards and WHO, ICRS, 2010, [44–47]. QE and GA were obtained from Sigma-Aldrich (St. Louis, MO, USA), whereas all other reagents were obtained from Merck. All chemicals and reagents were of analytical grade. All the results of spectrophotometric determinations of flavones and polyphenols were reproduced after establishing the confidence interval calculated for an average of a minimum of five determinations. The statistical differences between the means were determined using a two-tailed paired Student's t-test. Monica Butnariu contributed equally to this work. This paper was published during the project "Postdoctoral School of Agriculture and Veterinary Medicine", POSDRU/89/1.5/S/62371, co-financed by the European Social Fund through the Sectorial Operational Programme for the Human Resources Development 2007-2013. MB conceived the study, participated in the design and co-ordination of the experiments and data interpretation and helped draft the manuscript. CZC produced samples, performed data analysis and data interpretation. All authors read and approved the final manuscript.